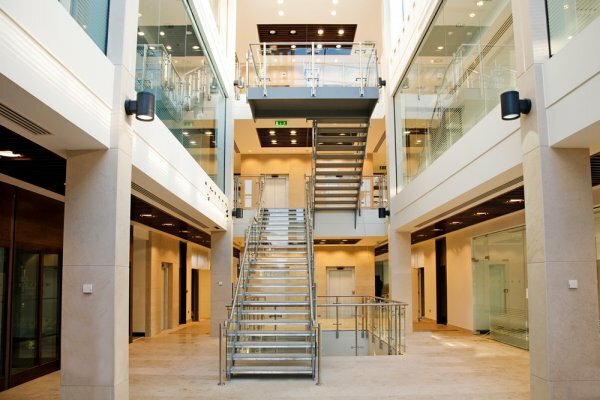 St. James Place (SJP) required a consolidation of their two existing sites into one single space in a new property. Aberley where initially contracted to conduct a Space Utilisation Survey (SUS) and Workplace Analytics, to inform a design brief for a new building. Aberley wrote an employer’s requirement document for the Design and Build contractor based on our findings. SJP wished to change the way the office space was used form a very formal atmosphere, with very traditional values and culture to one that was more of an inclusive centralised space for client entertaining and meetings. There were some considerable negotiations required with the various stakeholders, as they are entitled to their own dedicated work spaces, support staff and IT systems and therefore had a wide variety of ideas on how the new space should work for them. This meant the office layout was highly cellular. St. James Place operates an Academy for its Financial Planners, they were keen to ensure that there was a Chinese Wall between the Academy and the other partners. The Academy also had their own requirements for specialist training areas. Managing and gathering information from the end user and stakeholder was vital to the success of the project. In order to understand how they used their space we had to establish trust with each stakeholder and talk to them in depth about how they like work. We gained some very interesting insights into the way their business works and how they use every part of their space in a very specific and purposeful way. Thus allowing us to write a more informed Employers Requirement document. Space Utilisation Survey: A SUS was conducted across SJP’s London estate which allowed Aberley to collect data on their current occupancy and utilisation. The data from this survey helped to inform the Employer’s Requirement document for SJP’s new workspace. Establishing Trust: SJP’s culture was very traditional and formal. Aberley had to build trust and respect with the internal stakeholders quickly to ensure we were getting useful data to report on. Our Senior Management team and CEO were heavily involved in this project, providing ‘boots on the ground’ support and conducted interviews with SJP’s senior stakeholders. By using our Senior management team we were able to establish credibility very quickly and allowed our team to gain useful insights into their current utilisation. Workplace Analytics: Once all the interviews were conducted, we were able to gain some very interesting insights into how they used their current spaces and how they wanted their new work spaces to function in the new building. This enabled us to write an informed piece for the Employer’s Requirement document. Change: We also helped them identify their current workplace culture & offered advice on to how move their culture in the direction they were looking for. The move to the new building facilitated the cultural changes they were looking for. The depth of data Aberley provided allowed insightful and meaningful analysis, which lead to real world changes. Through our analytics we were able to offer recommendations which lead to Aberley writing a part of the Employers Requirement for the Design and Build team. Our findings were also presented to all end users who saw the value of our data collected, helping them with their new ways of working.